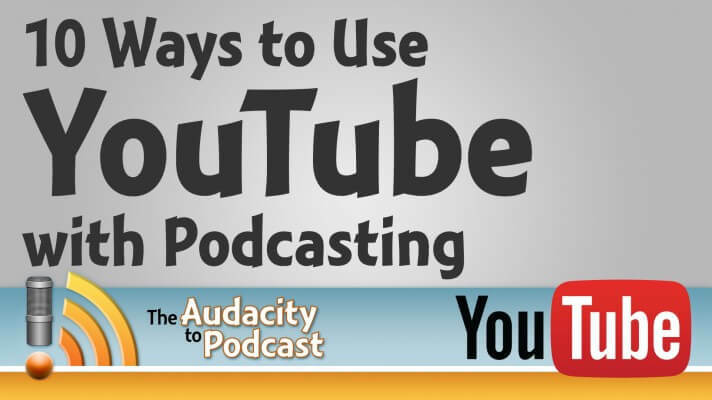 YouTube is not a podcasting platform, but podcasters can still use YouTube with podcasting. As another point of distribution, YouTube can help with search-engine optimization (SEO), growing your podcast audience, and complementing your platform. You can tell I'm highly critical of this method, and I think it does more harm than good. Within Noodle.mx Network, we've tried this and the plain view numbers (more than 21,000!) seem wildly successful for a 36-minute audio “video.” But the audience retention was horrible! 90% of the audience left within the first two minutes. Five minutes in, only 5% of the audience was left. That means that nearly 19,000 potential raving fans turned away and may never come back. Watch for a future post on TheAudacitytoPodcast.com with detailed information about this and comparisons with other methods. A step up from audio “videos” is to actually upload or stream real video to YouTube. When this is nothing but showing you talking (like in your “studio” or from a webcam), we call this “talking head” video. This is much better than “hacking” the system with fake video. But the retention will still be low because people may not be interested in seeing just your face all day. Please contact me if you publish talking-head video and are willing to be part of my ongoing research! 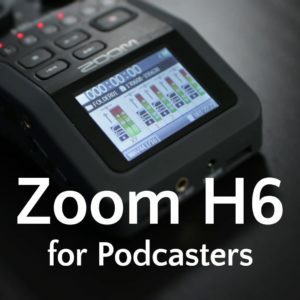 Video podcasting is expensive, especially podcast media hosting! A five-minute video in HD could take several hundred megabytes of storage. For this reason, I recommend that podcast videos be only 640 × 360. But if you'd like to show off your high-definition video, then upload the full 720p or 1080p video to YouTube. These HD videos won't be publicly downloadable for free podcast hosting. But this does make sharing your video podcast much easier and more social. These HD videos will embed on Pinterest, Facebook, Twitter, Google+, and more! Take your HD YouTube videos a step further by embedding them on your site. You may even want to replace the PowerPress video player with YouTube's. YouTube views won't contribute to your regular podcast stats, but it could improve the experience for your audience by providing an HD version. Google+ Hangouts and Hangouts on Air (the live-streamed version of Hangouts) let you invite multiple guests into your recording session. You can let Hangouts automatically switch the camera to whoever is talking, and choose whether to display thumbnails of other participants. This is much more engaging than just seeing your head when your guest is talking. It's also a lot easier than managing the video switching yourself with fancy hardware (like a Tricaster), expensive software (like Wirecast), or a decked-out studio with monitors (like Todd Cochrane's). You can use YouTube as a springboard to point people to your regular show by creating promos or teasers. Look at how Elsie Escober has done this for LibSyn's podcast The Feed. This can be a great opportunity for search-engine optimization, because you can make multiple videos for the same episode. Each video can have a different title, and you could provide short, valuable information in the video while pointing people to your main show for the full information. YouTube Live is now my choice for live-streaming video. It's free, you can control whether ads show, it works on mobile devices, and it even records directly to YouTube and is immediately available afterward. You can stream to YouTube Live with fancy software, like WireCast, Adobe Media Live Encoder, and more. But you can also go the simple route and use Hangouts on Air, giving you all the great power and simplicity of a Google+ Hangout. I recommend that you create your own /live page on your website, where you embed the YouTube Live player and your chat room of choice. Since YouTube Live creates a different URL (and thus embed code) for each event, I recommend the IX Show Latest YouTube plugin for WordPress for showing your upcoming, live, or most recent YouTube video automatically—without having to update your code every time! Podcast episodes can be long, and that's okay. But YouTube videos work best when they're short—five minutes seems to be the sweet spot. And the best kind of video for YouTube is actual video content. The kind of stuff you have to show for people to understand. For examples of these, look at what I do with Podcasting Video Tips on YouTube, or watch the great videos that Ray Ortega makes, which complement The Podcaster's Studio. Any kind of highly engaging video will do very well on YouTube. Show stuff! Or get out somewhere interesting and record in an attractive environment (like what DigitalRev does with their photography videos). Every video on YouTube gives you multiple opportunities to send people back to the platform you own. You can now place these hyperlinks in three places. Description—Link back to your site for the show notes, include a link (possibly an affiliate link) for whatever resource you're discussing. Annotations—These are the on-screen hyperlinks. They can be a speech bubble, and note, or a frame. This works great to put around any link you display on the screen (or mention in the video), and have a visual “subscribe” button that links to your subscription. You can now point these potentially anywhere by verifying your domain and making your own 301 redirects with a plugin like Pretty Link Pro or Better Links Pro. Comments—The thing I love about Google+'s now being integrated with YouTube is that I can finally include URLs in comments! So when I need to point a commenter to another resource, I can include the link and make it easy for them to go there. Any of these links could be affiliate links, links to other videos, links to resources, or links back to your own site. The video annotations don't show up yet on mobile apps, but that will probably come soon. Lastly, using YouTube with podcasting can help you make more money by enabling ads on the videos. You'll get a tiny commission anytime someone sees an ad, but you earn even more when they click on the ad. These ads come in multiple formats. Display ads (banners) run across all areas of the site except the Homepage. They are available as a 300×250 ad that appears to the right of the feature video and above the video suggestions list. Overlay in-video ads are transparent overlay ads that appear on the lower portion of your video. TrueView in-stream ads are skippable video ads that are inserted before, during or after the main video. TrueView in-display ads appear alongside other YouTube videos, or on websites that match your target audience. Non-skippable in-stream ads are video ads that can be inserted before or during the main video and must be watched before the viewer can continue watching the content selected. These ads can also be placed after the conclusion of a video, in the post-roll slot. Create a YouTube channel for each show/niche. Don't mix content into your personal channel. Make a Google+ page for each show, and then a YouTube channel for each page. This allows you to have managers who can upload content, tweak settings, add annotations, or manage your videos for or with you. Include links and promo text in your descriptions. Include a standard script about your show with links to it in the description for every video. This will be searchable and provides more opportunities to people to click through to your platform. Add your own video thumbnail. Don't let YouTube choose a thumbnail for you, unless you're in a hurry and it already looks great. I suggest big text with a relevant image. Include subscription annotations in every video. Make every video have a visual “subscribe” button for several seconds at the end. You can be as creative as you want, but always remember to link it. 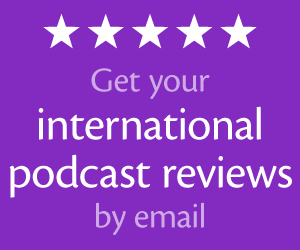 Get your international podcast reviews automatically emailed to you with My Podcast Reviews! Here's what I live-streamed to YouTube via Google+ Hangouts on Air. Unfortunately, I had my mixer set to not send my music out to YouTube, and I forgot to switch to Studio Mode for my audio. Thus, the audio isn't as good. Lots of good tips and examples. Most of these aren’t mutually exclusive so it seems that a podcaster could start from #1 and build from there as they are more comfortable with equipment, workflow, scheduling, and everything else that’s involved (which is quite a lot, really). I’ll listen to the audio version probably tomorrow, for now I just read it like a blog post. The SM7B is a quiet mic, so it needs a really good preamp. Everyone that I’ve heard use the SM7B was too muffled and had horrible sibilance. I do like the design of the microphone, just not how it sounds. Then again, most of what I hear could be the consequence of bad mic technique in trying to compensate for the microphone’s low output. Definitely true Daniel, the SM7B is a mic that needs a lot of clean gain and it’s definitely more demanding on ones microphone technique – it has a very small sweet-spot. ((I tested all the mics (other than the MXL) with a CL-1 Cloudlifter and a DBX 286s)). I think it’s a 2nd or 3rd Podcasting mic as opposed to a beginner mic. Publish your audio, but don’t? Yes? No? #1 thing to do. But don’t? hmmm… Confusing. Personally, I believe if you can, record video and audio, even if you do not initially publish the video. Reason? It is cheap (or free) to archive the video, and while you can always publish just the audio, you can never go back and add video to an audio only podcast. In the future, as bandwidth becomes less of an issue, someday we will probably see video as a requirement for distribution. In fact, we are already seeing this happen on several services that no longer allow audio only. And know this is not a monetary decision for those carriers (audio bandwidth is a drop in the bucket in comparison to the cost of video), it is because video content is no longer “the future”.. it is now. Just my 2 cents. It was just the first in a list of different ways, not that it’s the #1 thing to do. At the same time as video is getting more popular, more podcast apps are coming out that support audio only. Look at the #2 podcast app—Stitcher. It’s audio only. Wathcing the video, I was impressed with the quality. Very nice. How did you achieve the black background effect. Did you record using hangouts? Gear/spftware used? Yes, it was recorded with Hangouts on Air pumping straight to YouTube Live, which is why there are some little hiccups. I used my Logitech C920 and cheap lighting kit. The background is a black tablecloth hung from my ceiling. Skip to the last few minutes of the video where I move my camera around so you can see the layout. Thanks for this discussion, Daniel. I hadn’t been thinking about how I might use YouTube along with my podcast, but this episode gave me an idea. I have a podcast about a TV show, and my co-hosts and I used Hangouts on Air to live stream our discussions of the episodes in the most recent season of the series. I had immediately made the YouTube videos private after the live stream ended because they weren’t edited, and I didn’t think many folks on YouTube would be interested in watching an hour-and-a-half (or longer) video of three people just talking. However, we start each of our discussions with a quick review section talking generally about whether we liked the episode, why or why not, and those lasted only a few minutes. Now I’m toying with idea of editing the live stream videos (that are just sitting in my YouTube account gathering dust) down to just the quick review section to post on YouTube and then include annotations and links to our full-length discussions in our podcast episodes. I have no interest (nor the time or money) at this point to produce supplemental video content for my podcast, but I think this might be a way to use content that I’ve already created in a way that would be more appropriate for YouTube. Yeah, that’s a great idea! You could use YouTube’s “enhancement” feature to trim the video, or download the full HD video with http://clipconverter.cc and trim the video in your editing software. If you download and edit locally, you could even append something that encourages people to subscribe to your regular audio podcast, if that’s not within those first few minutes of video. I don’t have a podcast. I’m sorting through options for me to convey content and engage. I’m enjoying many of your shows as I sort through my objectives and options. I particularly enjoyed your show about using YouTube in conjunction. Thanks for all your help. Thanks, Jai! What do you think your podcast will be about? I checked out one of your videos and I have one suggestion. Get better mics. You should each have a mic. That can be a “studio” mic that sticks in front of your face, like I do. Or, if you regularly publish videos, then you could wear lavalier microphones. Gotcha. Which one did you check out? We have tried a few different arrangements and locations, to see how sound/lighting go. Right now, we are working with 1 shotgun mic, and since it’s pretty low budget to start, we try and just angle it right in the middle. Same with the lavalier, we only have 1 so we are kind of stuck in the middle between those options, haha. We will probably be facing echo issues for a while because of that. We may switch to lavalier though, since we do like the visual element, and audio-only outlets are secondary to our video podcast. Thanks for the input! What’s your budget for improving and what kind of audio recorder do you have now? I can recommend some lav mics that can connect to smartphones, if you have one in addition to a recorder. Then, you would just sync the audio and video in post. Hi! I recently started doing a weekly YouTube Live — it’s kinda like the “talking head” you describe. I show a small webcam window and a larger screenshare window where I use PPT to share key points, relevant data, etc. I want to use this weekly broadcast to create a podcast. Is there any software/options to automate this? In my dream world it would also automatically slap on an intro and outro. A girl can dream…. (If you are still seeking talking head case studies for your research, LMK if I can help). Really great tips on combining youtube with podcasting that are still relevant today. Thanks. Love his idea of Creating 5 min Content ???????????????????????? You can use podsync ( https://podsync.net ) to convert youtube channels to pocasts. 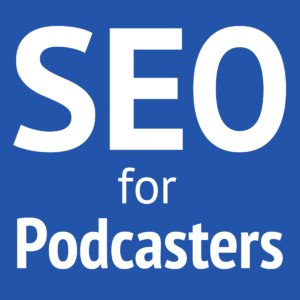 It’s free and easy: just paste a youtube link and get a link in podcast format.